Last year I decided to give out little bags of homemade granola to my friends as a personalized holiday gift. I was so impressed with myself for coming up with this cute idea – I bought little bags, ribbons, and a holiday rubber stamp so I could make them retail quality. I’m all about crunchy granola, so I searched for a recipe that sounded good and did what I always do – follow the recipe until I think I know better. 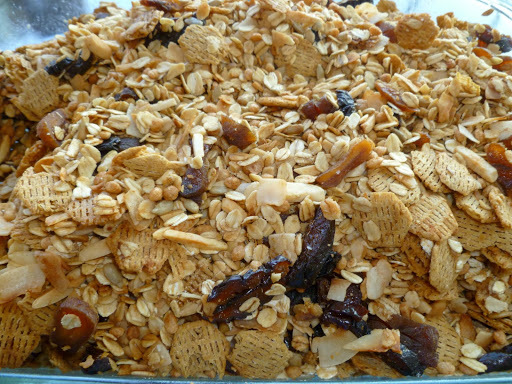 I cooked the hell out of the granola, and although it tasted good – it was like eating pebbles. The second batch was better, but I used coconut oil, which I knew wasn’t genius, but it was all I had. The granola didn’t really get crispy because coconut oil has a melting point of 76*F. Even in a solid form, it’s pretty soft (think slightly chilled butter). So, I did all this preparation; made large batches of granola, packaged, personalized and bragged about my creative endeavor – but I didn’t put it in the freezer to keep it fresh. No preservatives and plastic bags = stale granola. Although the thought was there, and my friends were sweet enough not to say anything, we all knew I gave them old cereal for Christmas. So, here’s what I learned: don’t use coconut oil for the fat content, don’t cook granola for 3-hours, and once it’s made, store in a container in the freezer. The recipe I present here, my newest (and most successful) isn’t overly sweet; it’s very nutritious, and will keep you quite… regular. If you drink coffee AND consume this granola for breakfast, make sure you’re close proximity to a restroom. 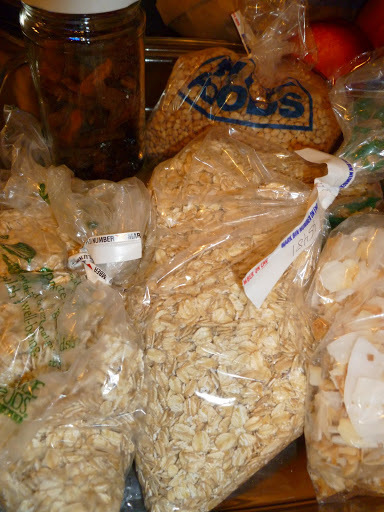 Shop the bulk section! You can get organic and interesting ingredients, like toasted crispy rice (top bag) flaked coconut, and sulfite free dried fruit. 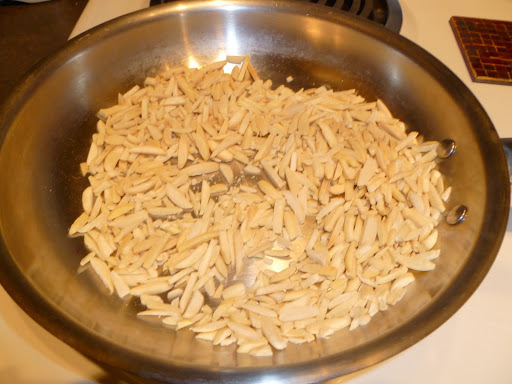 Preheat oven to 275*F. In a low/medium heated skillet, toast coconut flakes until lightly browned, set aside; toast almonds and set aside. In a large bowl, combine the ingredients oats through salt. In a small bowl or measuring cup, combine wet ingredients (oil, syrup and honey). Stir well to combine and spread mixture in a greased 12×15″ roasting pan. Bake for 45 minutes, stir and continue baking for another 50 minutes, or until golden brown. Remove from oven, stir in raisins and apricots and let cool completely; store in an air-tight container in the freezer. I just picked up The Sprouted Kitchen cookbook and she has a lovely granola recipe. I'm thinking of giving it a whirl. Come by the house, I'll have you take a baggie home for you and J.